A new study on Meat, Poultry & Seafood Packaging shows that this ~$11bn market is driven by prepared foods, items in smaller and more convenient sizes and packaging formats that make food preparation easier and faster. 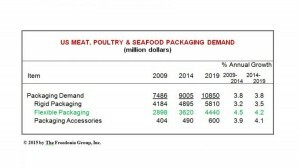 When it comes to the packaging market for meat, poultry and seafood that’s growing at 3.8% annually, growth in flexibles (expanding at 4+%) including barrier films is outpacing rigid packaging. Flex-pack advantages center on lighter weight, reduced material use and the marketing benefit of larger billboard space. “The prevalence of case-ready meats, which use modified atmosphere packaging and vacuum packaging, will drive gains for barrier films,” says Freedonia Group analyst Esther Palevsky. She expects vacuum pouches to see expanded usage with fresh, frozen, and processed items, while stand-up pouches will make further inroads into folding carton applications. 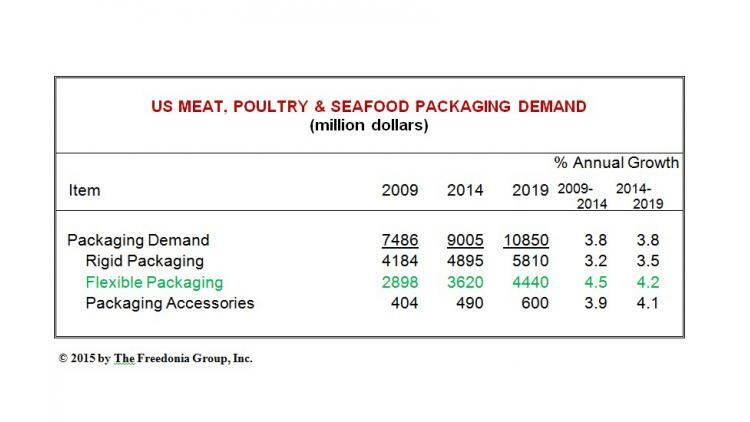 The study, Meat, Poultry & Seafood Packaging, projects that demand will increase 3.8% annually to reach nearly $11 billion in 2019. Underlying trends driving the market include increases in population, growth in foodservice and additional export opportunities. In addition, demand will be supported by continued solid prospects for prepared foods, items in smaller and more convenient sizes, and packaging formats that make food preparation easier and faster. Maturity in rigid formats including folding cartons and metal cans will continue, along with competitive pressure versus flexible packaging alternatives. Plastic containers will see the fastest growth among rigid packaging, though they, too, will face increased competition from lower-cost flexibles such as windowed bags and handled pouches for prepared foods. One rigid format—in fact the largest rigid segment—is seeing growth: Corrugated boxes, which will benefit from continuing requirements for shippers, the adaption of higher-value moisture-resistant boxes and/or modular boxes for case-ready meats.